Just Dennis? Well It seems that Dennis is the name to have in the 60’s or 70’s especially if you were the type who caused trouble and mischief. Yes while kids in the UK enjoy “Dennis the Menace” as a curly black haired menace causing havoc with police in the UK neighbourhood along with his dog Gnasher, the USA “Dennis the Menace” was younger, slightly more innocent and caused great upset to his neighbour Mr Wilson, oh yes he had blonde hair too. For UK readers not to miss out and so as to avoid confusion with Beano Comics Dennis, “Dennis the Pickle” or “Just Dennis” became the marketed name of the Dennis Mitchell. This USA comic strip was drawn by Hank Ketcham. His Dennis was always playing havoc in the Kansas area of Wichita. Dennis the Menace started off as a daily syndicated newspaper comic strip originally created, written and illustrated by Hank Ketcham, but has since then has become a movie, book and cartoon feature. It seemed to change names when converting media to the Television. The television version screened in the UK simply as Dennis. Characters included his dad Henry Mitchell. Alice Mitchell Dennis’ mom. Ruff – Dennis’ sheepdog. His suffering neighbours George and Martha Wilson. Dennis’ friends included Tommy Anderson, Joey McDonald, Margaret Wade a freckled red-haired, Gina Gillotti a young Italian American girl, who Dennis secretly has a crush on. Jackson added in the later comics. 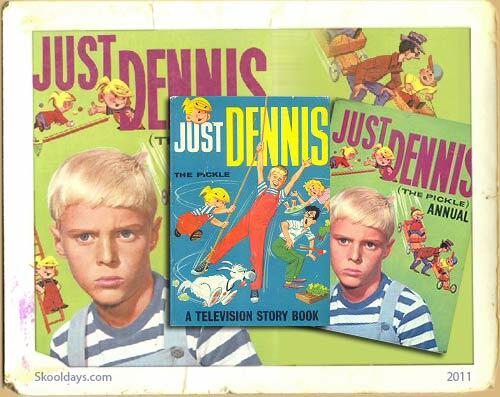 I loved the Dennis the Menace annuals though being a UK resident, always knew them as Just Dennis (the pickle) from the great Hank Ketchum TV series and Comic Strip. Another favorite was the other 1964 Dennis TV annual. It seems that more than one annual was released during the year of 1964. This entry was posted in Cartoon, Movies, PrimeTime and tagged 1960, 1970, 1980 by Skooldays. Bookmark the permalink.